Dear Lord, I’m so glad that I can come to You at any time. 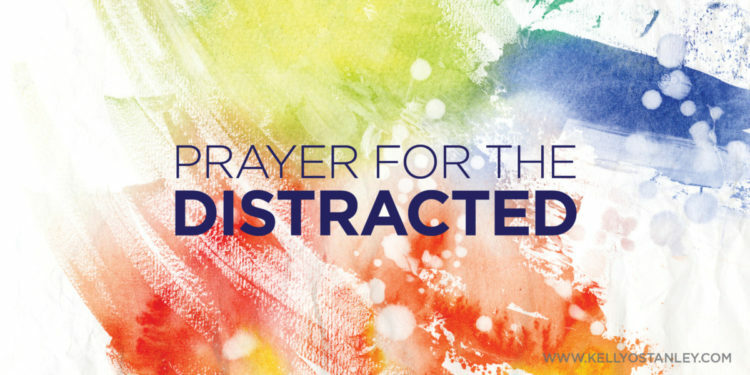 But I wish I could focus more, that I wouldn’t start my prayer and already be distracted before the end of the sentence. I hope that it doesn’t indicate a lack of interest in You. You know my heart, better than I do, but I think my intentions are good. I just can’t still my brain enough to stay on one thought for very long. And that can’t be the way it’s supposed to be. God, will You please help me? Are You laughing at the fact that between writing this line and the one before it, I answered an email, forwarded another, and deleted two more? Probably not, but You see all. You know how my mind works. And You know how I struggle. In order to go deep with You, I need to spend time with You. But I’ve cluttered my days with too many activities, lots of responsibility, and tons of unnecessary chaos. Straightening out my priorities would help me in numerous ways. If it helps me connect with You, that is reason enough to do it, but if it helps me find peace and calm in my daily life, that’s even better. I know that wherever You dwell, peace reigns. And that’s where I want to be. Show me tangible steps I can take in order to make smarter choices with my time. Give me determination to keep reaching for You. Strengthen my conviction that time talking with You is important and makes me better. It makes me more fully into the person You mean for me to be. As You transform me, my mind will focus more on You and will remain more steady. My hope will grow as I believe more thoroughly that You are the answer to all of my questions. My relationships will deepen as I receive (and learn to give) the kind of understanding You have shown me. The love I show others will be more generous and compassionate because I will have been changed by time in Your presence. And it all starts with more sustained focus on You. Please, Lord, honor my desire to spend time in prayer. Answer my heart’s cry for all You have to offer. Give me wisdom to not be waylaid by unimportant distractions. Help me forgive myself for my inability to do this on my own. And thank You that You want me to come to You in the first place. You are generous and kind. Merciful and powerful. Forgiving and full of love. You are amazing. And I want to see You more clearly. Amen. I feel like I’m constantly saying the same old thing on these guest post intros… I met this lovely woman through the Facebook group my agent set up for clients of her agency, and I haven’t met her in person, but I love her… yadda yadda yadda. The thing is, though, it continues to be true. They’re all interesting and talented, kind and generous—all-around lovely people. But I think Jayme Mansfield is really something special. Maybe because she wrote this incredible review of Praying Upside Down on her blog. Maybe because I love the name of her blog—The Blank Canvas: Fill it with Him. Maybe because she’s an artist. Or perhaps it’s because her book, Chasing the Butterfly, is really, really good. Or maybe I should stop trying to define it and keep it simple: She’s really awesome and I hope you enjoy this guest post. The Colorado Rocky Mountains are calling my name today. I’m fortunate—only a short drive from the west side of Denver will soon find me surrounded by forests of pine, valleys blanketed in wild flowers, high and fast-moving rivers from summer’s abundance of rain, and the remnants of last winter’s snow still capping the highest peaks. He knows me well. Anxious thoughts have been brewing—my teaching job, although wonderful, has tiptoed closer than when vacation began. The myriad of home and garden improvements waits impatiently on the “to-do list.” Best intentions to meet friends for coffee, wheedle away at the stack of books on my nightstand, and re-start my long neglected Pilates regime, now wait like bored spectators—hoping for even a bit of action. Worst of all (for us author peeps), is my next unfinished manuscript with the self-prescribed, ambitious, end-of-summer birthday—which will not happen. Sigh! Ah, yes, He knows me well. I could spend another weekend spinning in circles like my rooftop weather vane in a windstorm—heading north to the grocery store, south to the basement laundry room, east to mow the lawn, and then west to walk the dog. A momentary pause, when the wind is merely catching its breath, may allow me pause at my computer. Or, I could stop and breathe. Close my eyes, and pray—Lord, what do you want me to do? Where do you want me to be? And let His words play over in my mind, “But the Lord is in His holy temple; let all the earth be silent before Him.” (Habakkuk 2:20). Regardless of what I am doing, I do know this—He wants me with Him. Sometimes it’s among a whirlwind of people and activity—a beehive life. Other times, it is in solitude, quietness, and stillness—nestled in His presence. Yes, He knows me, oh, so well. Today, He’s beckoning me to spend time with Him alone (okay, Gracie will tag along as I’m convinced she is one of His favorite dogs.) I’ll turn the music off while I drive, hike to a favorite vantage point to gaze upon one of His many creations—and then I will listen, soak in the inspiration, the calm, and the peace that is essential before I write. But most importantly, I will be with Him so that I can hear the what—the answer to my prayer to be reoriented, to have my physical, emotional, and spiritual compass be recalculated. After all, I’m convinced that is when the views are most glorious. 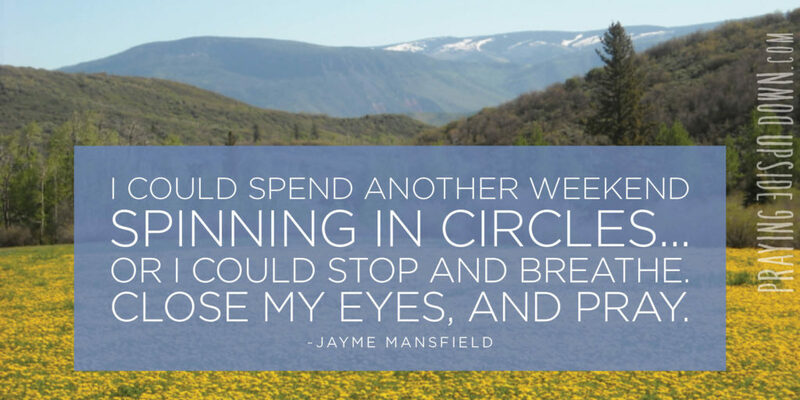 Author Bio: Jayme H. Mansfield is an author, artist, and educator. She provides vivid imagery as she melds her inspiring writing and artistic talents. 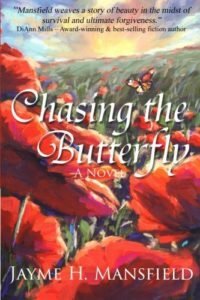 Her debut novel, Chasing the Butterfly, released in late summer 2014, by Lighthouse Publishing of the Carolinas. 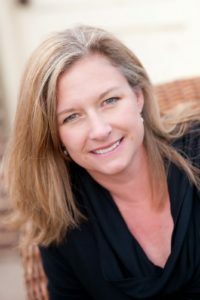 Recently, she was awarded the 2015 Christian Small Publishers Association Book of the Year in Historical Fiction and the novel is a 2015 Inspirational Readers Choice Award Finalist for Women’s Fiction. Her passion for weaving stories about women who find their strength in the Lord continues in her upcoming novel, Rush, a historically compelling tale of the Oklahoma Land Rush in the late 1800’s. 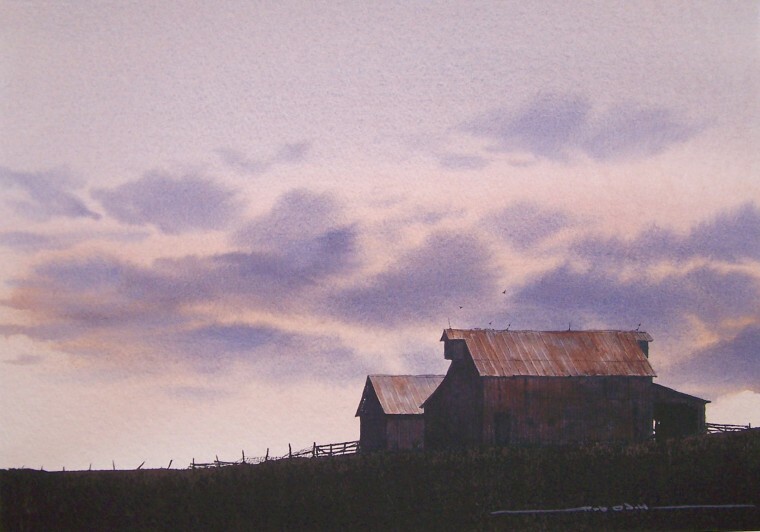 Jayme owns, paints, and shares the joy of creating visual art with children and adults at the Piggy Toes Art Studio in Lakewood, Colorado for the past twenty years. After a career in both the business and creative sides of advertising, Jayme received her teaching and Master’s Degree in Elementary Education and Creative Arts. For many years in elementary education, she has shared a passion for literacy and the writing process with her students. She teaches at Aspen Academy in Greenwood Village, Colorado. She is married to James and has three teenage boys. If you don’t know me personally, here’s one thing you should know about me: I’m not one of those amazing, hands-on moms who fills her summer with trips to the pool or the zoo or neighborhood parties. In fact, I’m so NOT a Pinterest-worthy parent that I probably won’t even have time to LOOK at Pinterest all summer. Today is the last day of school. I have approximately an hour and forty-five minutes left of my last solitary, quiet day. And I am not going to spend it making a list of all of our family goals for the summer. I love my kids. A lot. But ever since I have been working from home (which, incidentally, is the complete lifetime of all three of my children), summers have stressed me out. Everyone who knows me is probably sick and tired of hearing me complain, but here’s the deal. I still have just as much work and just as many deadlines. But in the summer, I have to do those things with a house full of people and the clutter which they bring with them. Yes, I know I chose to bring those people into the world. But what I didn’t know then? That their summer schedules for sports and honors classes would include things like three-times-a-day practices and three-chapters-a-week reading and discussion questions and three classic books complete with papers that need to be written. I thought summers were supposed to be time off. If you’re a teacher who assigns such a thing, please know I probably like you very much in person. I just don’t care for this particular approach to summer. At all. On top of my resentment about other people imposing on my schedules, I find that warmer weather reveals some things that aren’t so pretty. And I’m not talking about jiggly, white thighs. (Although I have those, too.) I’m talking about jealousy. I believe whole-heartedly and fervently in protecting your skin from the sun. The more tan you are, the more we probably disagree on that issue. And yet I envy all of the smooth, sun-bronzed legs I see. The beach photos. The skinny bodies in bathing suits (I drown out my jealousy by eating more junk food). I’m jealous of all the vacations people go on, because Tim never has much vacation time available, and we can never seem to find more than a couple days at a time to do things as a family. We may go one at a time, but rarely together, and I constantly struggle with resentment for people who have lots of time off. Then again, wasn’t I just complaining about having to have so much togetherness during the summers? But really, I know that summer’s not the problem. I am. Because I have everything I need. And so very much more. I guess my attitude all comes down to this mistaken belief I have that I should get everything I want. That I deserve time off. That I deserve alone time. That I deserve to indulge myself. Funny, I don’t remember seeing verses about that in the Bible. True, Jesus insisted on some alone time. But his goal wasn’t to run to Target, to veg out on the couch with a new book, to post perfectly-filtered pictures of his vacation destination on Instagram, or to spend some time at a friend’s pool. When he went to the pool, it was to heal the lame man. 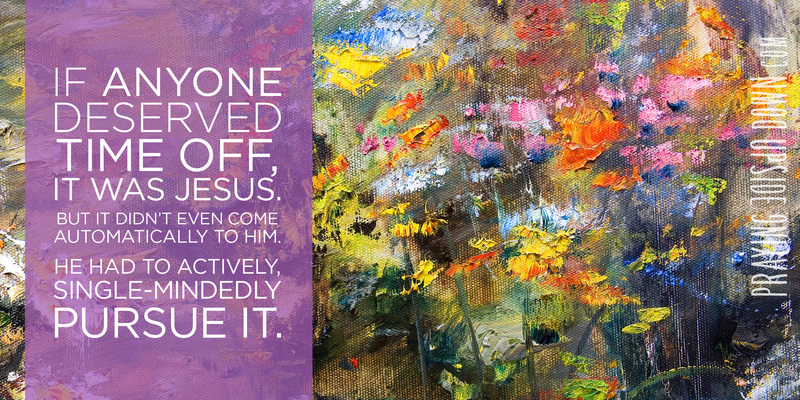 When he went off by himself, it was to get ready to do the next thing God asked of him. If anyone deserved time off, it was Jesus. But it didn’t even come automatically to him. He had to actively, single-mindedly pursue it. He caught a quick nap in the boat in the middle of a storm. At dinner, alongside the road, when he came down from the mountains, even when he stopped for a drink of water—always there were people with all kinds of needs. He withdrew by boat to a solitary place and the crowds followed him on foot. And he had to ask his disciples specifically to keep watch for him while he prayed in the Garden. He doesn’t get what he asks (or deserves): they fall asleep. So the one thing I need to do to find rest has nothing to do with events on my schedule and everything to do with how I fill my time. As I mentioned earlier, I won’t be making a list of summer adventures for my family to cheerfully pursue. But I will set some priorities, because I’m headed into a season which is always a challenge for me. Just skimming through the Gospels to make sure I have my references right in this post, I feel comforted. So I will find—no, make—time to read the Bible. To complete Seamless: Understanding the Bible as One Complete Story, a new Bible study by Angie Smith that I’ve started and already love. I’m on day three, and I’ve already uncovered a profound truth about myself by seeing an old Bible story in a new way. I will read Untangled: Let God Loosen the Knots of Insecurity in Your Life, a new book by Carey Scott, which in just the first two chapters has already begun to soothe my soul. And I will write, both here and in my journal. And I will pray, and I will reach out to friends and answer emails from strangers and let loose the love God has given me, spending it freely and widely whenever the opportunity arises. And in those moments, I will find quiet. In those words, I will rest. In those stories, I will find focus and hope and everything I need to take my next steps, whatever they are. Even if they’re just steps to and from the car as I drive to sports practices and nag remind my son about his summer assignments. And I will remember that Jesus took himself to the mountaintop to pray. Nobody did it for him, and no one forced him. He knew what he needed, and he put forth serious effort to make it happen. Because without that time in prayer, he wouldn’t be equipped for his work. Without a strong connection to the Almighty, he was nothing. Until his soul could rest, his body could not. Oh, how I long for my soul to feel rest. I already feel a stirring of possibility. And instead of collapsing on the couch, suddenly I want to run—straight towards the hope I see on the horizon. I give thanks for what I know is waiting for me. And I’m going to do my darnedest to help myself find what I know I need. And it’s not going to be in the pile of discarded folders and broken pencils dumped out on the floor next to my son’s backpack. is to live in the house of the LORD all the days of my life, delighting in the LORD’s perfections and meditating in his Temple. My dad told me about a meditation class he attended a few weeks ago. The instructor asked them to close their eyes and picture the most beautiful mansion they could imagine. She then guided them through the rest of the scene—notice the peak of the mountain in the distance behind it. Look at the sky. And so on. That, to me, sums up the beauty in creating art. Finding that place inside, the place where you can quiet your mind and open your heart and breathe. A place where you can dwell, delighting in what you’ve found. A place of safety and of peace. Here’s the thing. You don’t have to paint to find that. It’s available for all of us—whether we’re artists or not—when we do the things we were made to do. Maybe that thing is being an attentive mom, listening with care to an especially long story, even if the phone is ringing. Perhaps it’s wiping down counter tops after spreading peanut butter on bread, content because your family is fed and you find satisfaction in caring for them. Maybe it’s what you feel at the front of a boardroom, when all the managers present are focused solely on you. You might find this peace in the middle of a chaotic classroom as you try to retain control of a math lesson. Or possibly you find that moment with headphones on, typing away at your keyboard as the novel you always wanted to write begins to come to life. The Bible reminds us that God came to dwell with us, that we are His holy temples. And I believe that when we do the things God made us to do—as hard as it is sometimes to figure that out—that we’re essentially abiding with Him. Delighting in the Lord, meditating in His Temple. It’s where He wants us to be, safe and protected from the cares of the world. Fully alive. Completely in touch with Him. So today, if things feel out of control, if deadlines threaten to strangle you or chaos overwhelms you, sit down for a moment. Close your eyes. And imagine that place where you can find Him. Touch Him. Open your soul until you can see Him again. And if you can stay there with Him, let yourself. But even if someone or something else is demanding your attention, try to hold on to that connection as you go about your day. Because wherever He is, wherever you are with Him, it’s the most beautiful place you could possibly imagine.